It's that time of year again, the leaves are changing, the presence of hoodies is on the rise and the wonder of what winter may bring proves intriguing. Long range forecasts are used by businesses to manage risk or manage supply of weather-demand products, they are becoming increasingly important. 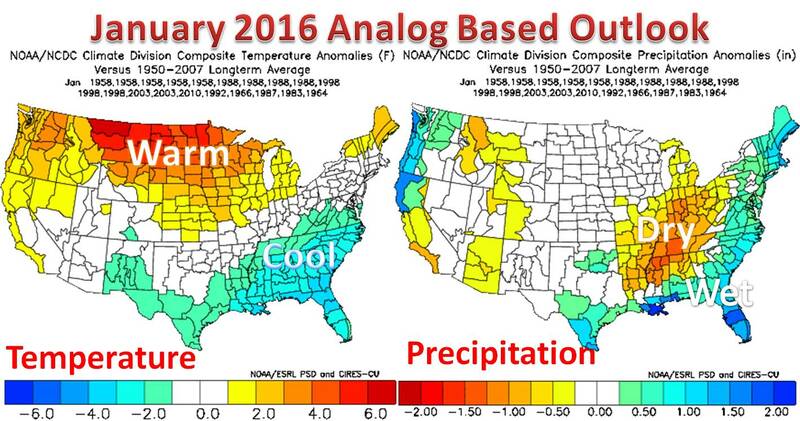 In the general community, long range forecasts provide for good debate and curiosity. Some people live for the snow and cold, and some could do without. No matter what side of the spectrum you fall, anticipating the upcoming winter can put you in the correct mantra and even plan ahead for those crazy few months of weather. 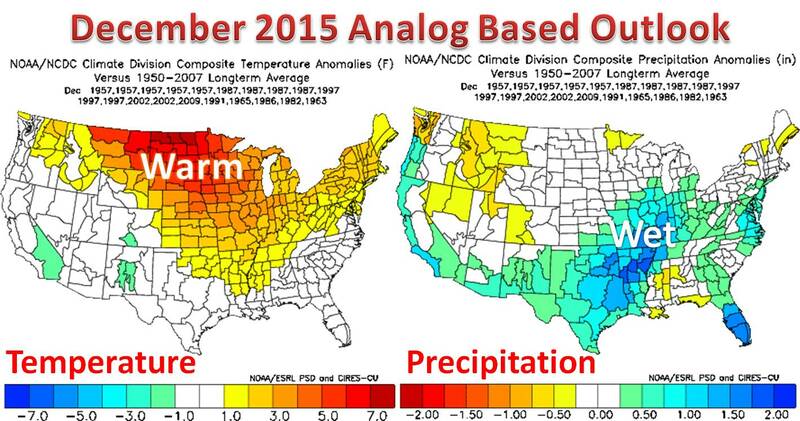 Alright, let us dive into the Midwest Weather Winter Forecast for 2015-2016! Full forecast at the bottom of the page. Long range or seasonal forecasting can prove to be a challenging endeavor, but understanding the moving parts of the "winter weather system" is not impossible. The key is to understand what factors have the strongest signal to the winter ahead. Last year we were able to pin down isolated features, such as the massive Siberian snow pack and record cold lake temperatures. These features added value to the analog years (or years with similar atmospheric and surface conditions) we chose. 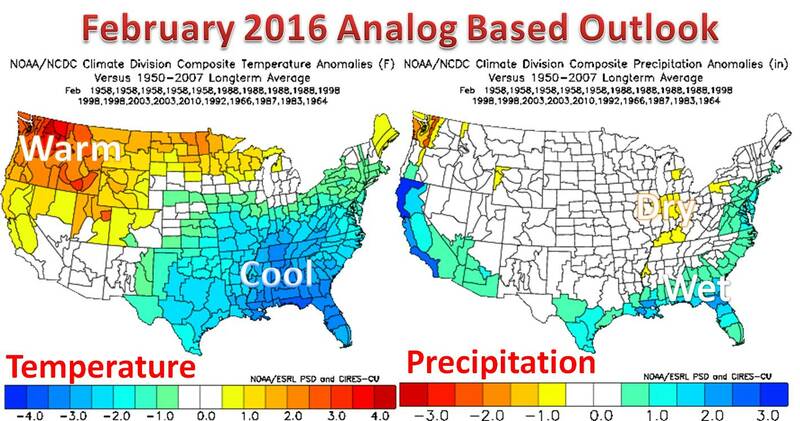 This year, we are in and heading to a plateau of near record El Nino conditions. The merit and significance of the warmer than average ocean temperatures in the Pacific will be discussed later. There are several areas to point out on this plot, many of which will provide significant clues into the fate of our upcoming winter. The vast area of above average SSTs in the Central Pacific are classified as the positive or warm phase in the southern oscillation, also called ENSO, but more commonly known as El Nino (Saturday Night Live Clip). This feature on the planet is a stable indicator this winter, as ocean temperatures are forecasted to stay well above normal. However, the trend is to head back towards a neutral standing and possibly La Nina in a year, time will tell. 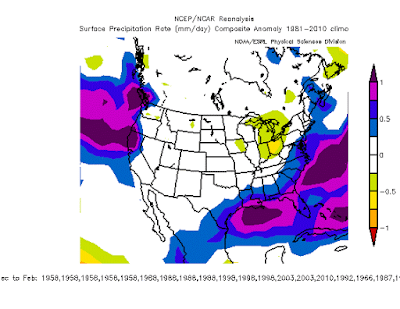 Below is a probabilistic forecast from the Climate Prediction Center, CPC Link. Furthermore, in relation to ENSO, the waters in the western Pacific are also relevant. Not so much the fact of warmer or colder than average, but rather the location of the gradient from warm to cold. In the Central Pacific a circulation in the vertical, called the Walker circulation develops. 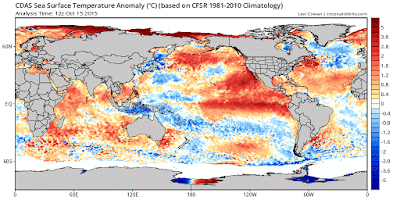 It is the main driver of prolonging the ocean anomalies. In an El Nino year, relative low pressure sets up in the Eastern Pacific and high pressure in the Western Pacific. Convective activity sets up in the east and tranquil weather in the west. Consequently, a cold pool of water will set up in the west. This year that transition sets up near the international dateline. This location is key as it affects the mid-latitude jet, and is very similar to the location in 1997 and 1983, which will be helpful in determining analog years, which we will get to further down. ENSO is not the only determining factor, relating to ocean temperatures, next we look to the North Pacific and North Atlantic for more answers. The North Pacific is proving to be the largest wild card in our winter forecast, but let's discuss. At the moment, the eastern shore of the Pacific is seeing above average SSTs, the ocean circulation is slightly weaker, allowing for less upwelling along the coast. This observation does coincide well with the so called, "Super El Nino" of 1997. This map above was made using an online program courtesy of the Earth System Research Labratory. It shows the SSTs of September through November in 1997 relative to average. 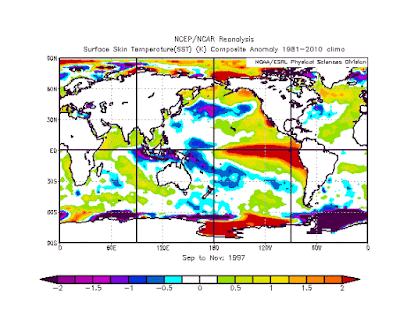 This is also described as the warm phase of the Pacific Decadal Oscillation, or PDO. 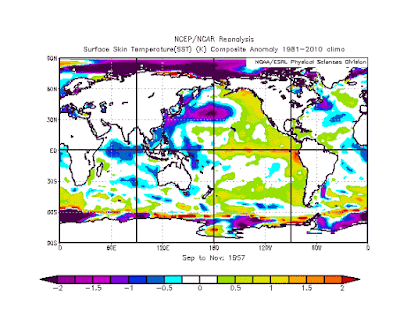 Historic data can be found Here.The Pacific Ocean temperatures match up very well to current conditions. However, an active period in the Gulf of Alaska is working to cool the ocean surface as storm systems continue to roll through the region. Strong surface winds bring cold water to the surface through a process called Ekman pumping. Watching these SSTs evolve over the next couple months could influence our winter, but the current thought is that these waters will stay above average, via climate models. 1997 does provide guidance in terms of the Pacific Ocean, but looking at the Atlantic, this year tells a whole different story. In terms of the Atlantic, 1957 proves to be a better comparison. The AMO index (Found Here) from 1957 is near 0.2, while this year we stand at 0.3. The confidence is higher that theses waters will stay cool through the season. With the presence of melting fresh water near Greenland and the weakening of the Gulf Stream, the water of the North Atlantic has been cooling for several months now and models hold steady through the winter. Looking at the variability in ocean temperatures over the course of the previous decade is a proven way to forecast the future, "Learn from your history." However, it may be very difficult to simply look at maps of the oceans to understand exactly whats going on. Dozens of teleconnection indices have been developed to quantify the oceans and atmosphere. 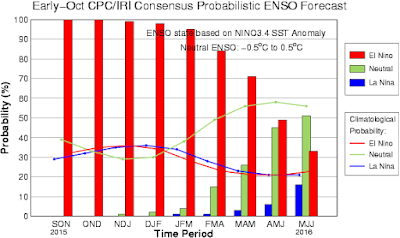 We will look at three of the largest players in seasonal forecasts, or the ones that are the most stable; the ENSO, PDO, and AMO, mentioned earlier. Since ENSO will certainly be the largest influence in the Midwest weather winter forecast 2015-2016, the strongest El Nino episodes in the last 70 years were examined and the top 11 were chosen. These are the years that will pass through our analog analysis. On the left is historical data from the strongest correlation years, and current data below it. A positive PDO is characterized by warm water in the Gulf of Alaska stretching down through the East Pacific and Central Pacific, with the AMO considering conditions in the North Atlantic. These values were then scaled to give equal weight in determining how similar they are to current data, with the AMO given the least weight, since it is down stream of the Midwest. Scaled and weighted values give us a ranking a how similar the conditions of the oceans were in prior years. The ranking gives us an insight into how similar future weather may be in the long run. This analog forecasting method for the Midwest winter forecast 2015-2016 did prove valuable in Last Year's Outlook. It is no surprise that 1957 an 1997 were among the top, but a few other years did make tho list. The red colored years are the top 3 El Nino Episodes since 1950. 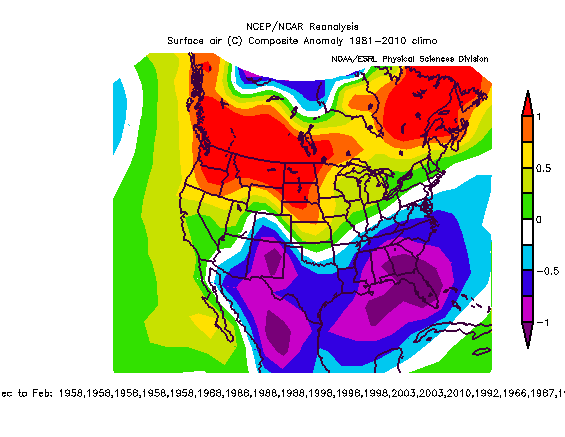 The following maps will look at a monthly composite of these analog years as they compare to the normal values over the course of the previous century. In general, we are looking at a warm and wet start to the season, with relatively cooler and dry weather working in as we close out winter. March is somewhat of a wild card. It will depending on how "wavey" or amplified the jet stream becomes and with a weakening El Nino expected by that time, March is a month to watch, and is not included in our winter forecast. The Climate models also agree! Check them out below. There is a lot of agreement between analogs, models, overall patterns, and local effects. 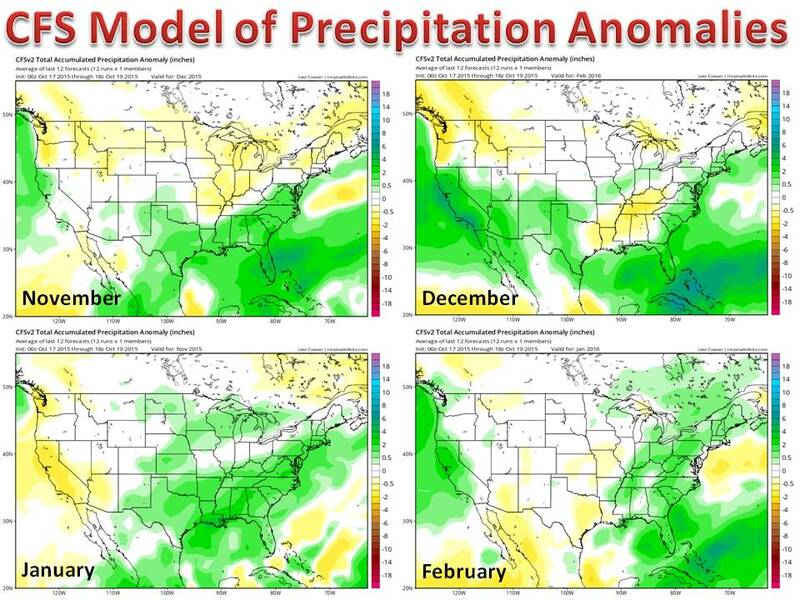 Confidence is very high that a warm winter will exist in northern regions, and a drier than usual winter will persist in the Ohio Valley. Overall snow is tougher to predict this year, with near average expected, but the potential exists for a few storms to skew some averages, more discussion below. THE OFFICIAL FORECAST: Be sure to share with your friends, the good/bad news! 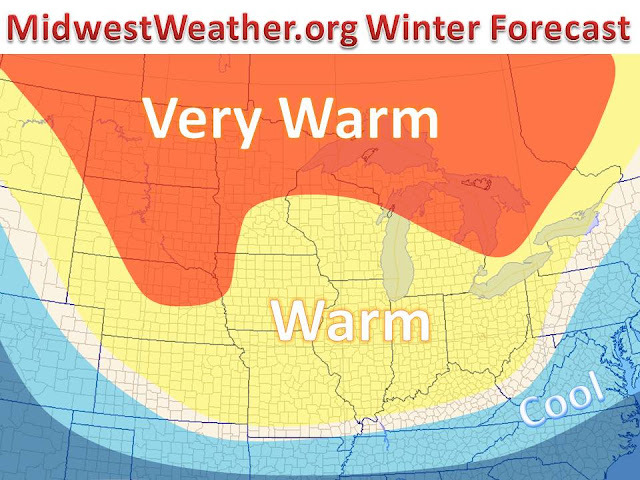 After several weeks of deliberation and research, we finally come to the official Midwest Weather winter forecast. 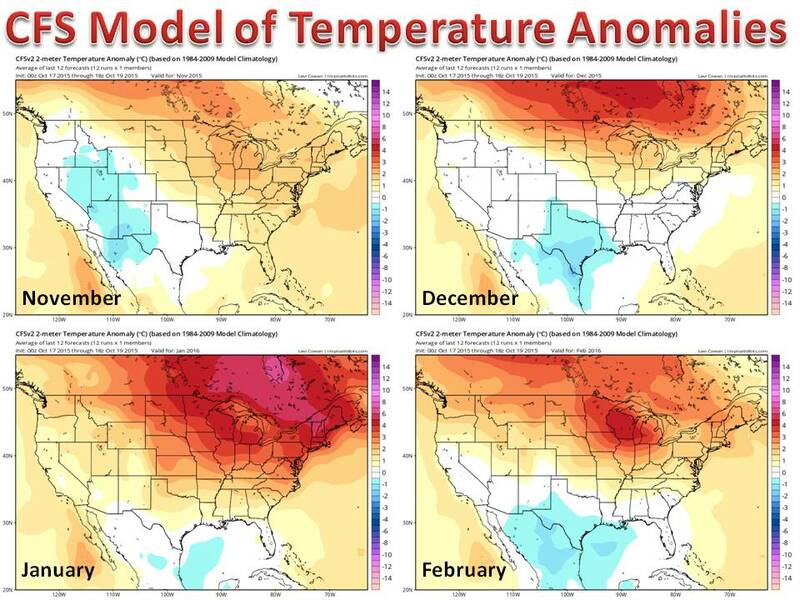 Based on the prior, it is no surprise we are looking for above normal temperatures across the Midwest, with the warmest air in the northern Great Plains and Great Lakes, cooler south. Lake temperatures are warmer than last year, via GLCFS, which among others is a large factor that trends to a longer lake effect season, but still overall less snow, with the absence of large cold air outbreaks. The past couple winters have featured a dominantly northwest to southeast jet stream, yet this year it will be much more zonal, west to east. Any amplification in the jet could bring us some large winter storms. It looks to be more active than past years, as storms systems originating from the west will have more moisture to tap into, than ones from the northwest. 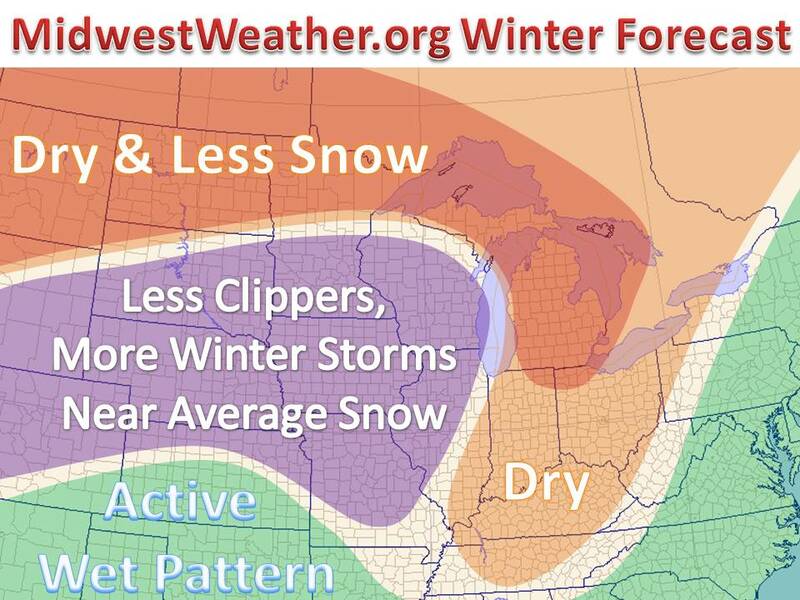 Depending on where each individual storm tracks, snow amounts could be below or above average in the highlighted area. With that said, it does look like more winter storms and less clippers (1-3"/2-4" like systems). Thanks for checking us out, we will continue to bring the latest forecasts heading into the Winter season. Feel free to ask questions across Twitter and Facebook, links below. Any personal inquiries can be directed at verstegentanner@gmail.com. Thanks for stopping by out 2015-2016 Winter Forecast, an update may be posted in November, depending on how much conditions in the North Pacific change, or if there is any new development in ENSO. In the meantime, be sure to keep it here to Midwest Weather for all the latest in weather forecasts and stories around the area.